Donald Marshall Jr. was a Mi'kmaq man born in 1953 who was wrongly convicted of murder. His case is one of the most controversial cases in the history of the Canadian criminal justice system due to the racism involved in it. 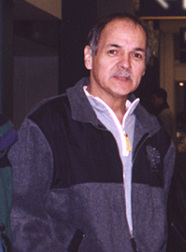 His father, Donald Marshall Sr., was a Grand Chief of the Mi'kmaq. In May 1971, Donald and his friend Sandy Seale were walking in a park when they attempted to rob an elderly man who than pulled out a knife and stabbed Sandy. Donald ended up being convicted for murder and sentenced to life in prison at the age of 17. Donald spent 11 years in jail until his case was re-examined and he was found innocent. He than had to struggle with the government to recieve compensation, and was awarded a lifetime pension of 1.5 million. It was then concluded that there was racism involved in his conviction and that the criminal justice system had completly failed him. Donald was later involved in a second high-profile case when he was caught catching and selling eels out of season and without a license. The Supreme Court upheld a very old treaty between the British and the Mi'kmaq stating that Mi'kmaq had the right to earn a moderate livelyhood from fishing or hunting, so Donald was innocent. In 2009, Donald Marshall died from complications with a previous lung transplant.